TerraClean is the by-product of research being carried out by a group of environmentally conscious Canadian physicists in their attempts to create an ultra low emission internal combustion engine. Their test vehicles were retrofitted with a "molecular injector" so they were operating the "TerraClean" system as part of the vehicle's on board fuel system. When their technicians stripped down the vehicles to evaluate impact of the technology they identified the fact that there was little evidence of carbon build up. 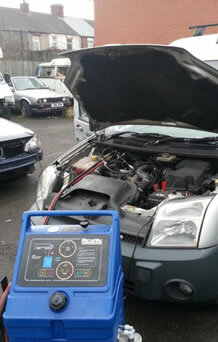 Uncertain if this was due to the vehicles ages they specifically applied the technology to a known older vehicle, operated the TerraClean technology, then stripped down this vehicle too. The point was proven, all the carbon which would have build up in this vehicle throughout its years of operation was gone. Regrettably the running costs of operating a vehicle full time on the chemical solution with the molecular injector as part of the vehicle made the project commercially non viable. The TerraClean brand is developing well with over 100 machines in the UK marketplace reached in a relatively short period of time and the Irish market growing with great pace. One of the current operators is the very influential ADS of Preston operated by Frank and David Massey who are very well known and respected for their technical training. Followers will be aware of their AUTOiNFORM publication, a must read on line magazine for 1000s of UK motor trade professionals. The September 2012 edition includes a TerraClean feature with a video in which Frank Massey explains in his own words how the technology works.